Yeshmebet Asmamaw, 25, has made chewing the drug a ritual, repeated several times a day: She carefully lays papyrus grass on the floor of her home, brews coffee and burns fragrant frankincense to set the mood. Then she pinches some khat leaves, plucked from a potent shrub native to this part of Africa, into a tight ball and places them in one side of her mouth. “I love it!” she said, bringing her fingers to her lips with a smack. She even chews on the job, on the khat farm where she picks the delicate, shiny leaves off the shrubs. Emerging from a day’s work, she looked slightly wild-eyed, the amphetaminelike effects of the stimulant showing on her face as the sounds of prayer echoed from an Orthodox Christian church close by. Ethiopians have long chewed khat, but the practice tended to be limited to predominantly Muslim areas, where worshipers chew the leaves to help them pray for long periods, especially during the fasting times of Ramadan. But in recent years, officials and researchers say, khat cultivation and consumption have spread to new populations and regions like Amhara, which is mostly Orthodox Christian, and to the countryside, where young people munch without their parents’ knowledge, speaking in code to avoid detection. Most alarming, the Ethiopian authorities say, is the number of young people in this predominantly young nation now consuming khat. About half of Ethiopia’s youth are thought to chew it. Officials consider the problem an epidemic in all but name. The country’s government, which rules the economy with a tight grip, is worried that the habit could derail its plans to transform Ethiopia into a middle-income country in less than a decade ― a national undertaking that will require an army of young, capable workers, it says. Khat is legal and remains so mainly because it is a big source of revenue for the government. But there are mounting concerns about its widespread use. As many as 1.2 million acres of land are thought to be devoted to khat, nearly three times more than two decades ago. 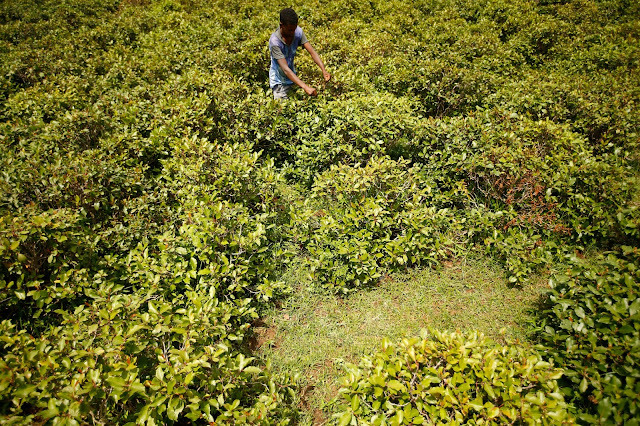 And the amount of money khat generates per acre surpasses all other crops, including coffee, Ethiopia’s biggest export, said Gessesse Dessie, a researcher at the African Studies Center Leiden at Leiden University. That payoff, and the dwindling availability of land, has pushed thousands of farmers to switch to khat, he said. The changes have come as the government has pushed farmers off land that it has given to foreign investors in recent years. Often associated with famine and marathon runners, Ethiopia is trying to change its global image by engineering a fast-growing economy, hoping to mimic Asian nations like China. It has poured billions of dollars into industrial parks, roads, railways, airports and other infrastructure projects, including Africa’s largest dam. In cities across the country, skyscrapers grow like mushrooms, and along with them, dance clubs, restaurants and luxury resorts. According to government statistics, the country’s economy has been growing at a 10 percent clip for more than a decade. But for all the fanfare surrounding what is often described as Ethiopia’s economic miracle, its effects are often not felt by the country’s young people, who make up about 70 percent of the nation’s 100 million people. There simply are not enough jobs, young people complain, often expressing doubt over the government’s growth figures. It is because of this lack of jobs, many say, that they take up khat in the first place ― to kill time. “It’s a huge problem,” said Shidigaf Haile, a public prosecutor in Gonder, a city in northern Ethiopia, which was rocked by violent protests last year, mainly by young people over the absence of jobs. More than half of the city’s youth now chew khat, Mr. Shidigaf said. Many gather in khat dens away from prying eyes. “It’s because there is a lack of work,” he added, saying there were numerous cases of people who were so dependent on the leaves, sold in packs, that they turned to petty crime. The government recognizes the problem, he said, but so far it has not been tackled directly. “It’s bad for Ethiopia’s economic development because they become lazy, unproductive, and their health will be affected,” he said. Dependency on khat is more psychological than physical, according to Dr. Dawit Wondimagegn Gebreamlak, who heads the psychiatry department at Addis Ababa University in Ethiopia’s capital. Chewing it “is quite a complex cultural phenomenon,” he said, adding that simply banning it would be difficult, given its role in cultural rites among certain religious groups. Mulugeta Getahun, 32, studied architecture but works as a day laborer. “I chew khat when I don’t have a job,” he said. “Nothing entertains me more than khat.” Sitting in a bar here in Bahir Dar, about 340 miles from Addis Ababa, where he was coming off a high, he drank “chepsi,” a home-brewed millet wine that helps neutralize the effects of stimulation. A group of men sat around drinking the homemade liquor and chewing khat, an act that could be considered illegal under the current state of emergency. After last year’s protests, and their subsequent violent crackdown by security forces, the government prohibited communal activities because meetings were seen as a threat to public order and a potential gathering place for dissidents. Still, the young are defiant. 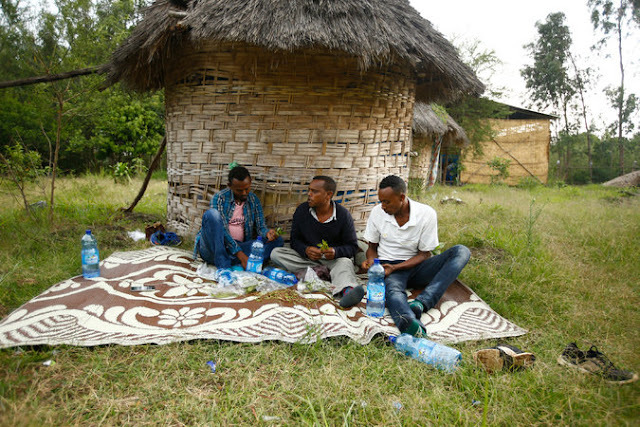 There are “bercha-houses,” secret khat dens, where young people congregate in cramped rooms, bobbing their heads to Teddy Afro, a popular Ethiopian pop singer whose lyrics are considered veiled criticisms of the government. There are hide-outs on the banks of the Nile River, where young people stretch themselves out under mango and banana trees, chewing khat and throwing peanuts in their mouths. Even a guesthouse where Mengistu Haile Mariam, the authoritarian ruler ousted by the current governing party 26 years ago, stayed during the summers was recently overrun by young people celebrating the end of their studies, some chewing khat in one of the bleak Soviet-style rooms with the curtains drawn. Yared Zelalem, 17, and Yonas Asrat, 27, chewed khat on the side of a street in Addis Ababa, waiting for the odd job of washing cars to come their way. They had been chewing for five hours already, and it was still early afternoon. They both arrived in the capital 10 years ago looking for work, they said, after Mr. Zelalem’s parents died and Mr. Asrat’s family was kicked off its farmland to make way for a resort hotel. Mr. Zelalem, the 17-year-old, lives next door, in a boxlike structure with just enough space to fit his small frame. He was more determined. “I want to become prime minister and change the country, and give jobs to young people,” he said, the words “Never Give Up” tattooed on his arm. He opened the door to his abode, which was fashioned out of corrugated metal. A backpack hung on a nail, next to a cutout of Jesus pasted on one wall. He took out his school notebooks, full of his meticulous handwriting. “I want to study natural sciences, then become a doctor. Then I want to study social sciences to learn about politics,” he said, listing off his ambitions.